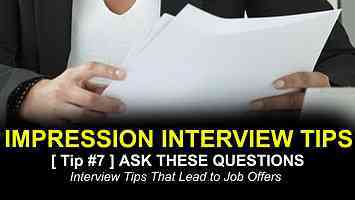 Interviewers always expect a good question from candidates before finishing an interview. Asking good question shows that you are interested, enthusiastic and well-prepared. Try not to ask questions that can be answered with a simple yes or no answer. A good response to the interviewer asking, "Do you have any questions?" would be: "Yes, I do." It will show the employer you are keen, you’ve thought about the role in detail, and that you’ve gone the extra mile to prepare. You need to ask questions that are related to the job, company and responsibilities, but do not ask him questions that would offend him or sounds funny and offensive. You need to develop a list of questions that show you’ve prepared and really thought about the role. Avoid asking questions which would not match your personality, your age or your style.